Having covered the Northeasternmost terranes in the US and Canada -- Meguma in Southeast Nova Scotia, Avalonia strung out from Newfoundland to South Carolina and a Late Paleozoic-Early Mesozoic Maritime Cover terrane deposited atop mostly Avalonian rocks in the Canadian Maritimes and South East New England, we will now move inland to the next terrane. These are what remains of the deep water portion of the Iapetus ocean that once separated North America (Laurentia) from Avalonia. Sometime before 600 million years ago almost all the continental rock on the planet collected itself into a single "supercontinent" that geologists call Rodinia. Rodinia is not to be confused with the much younger supercontinent of Pangea. Pangea assembled itself about 300 million years ago and broke up roughly 200 million years ago. About 600 million years ago, rifts developed in Rodinia. It fractured into as many as eight fragments. One of these fragments consists of the rocks underlying most of North America. It is called Laurentia. A second fragment included much of what are now Africa, South America, Australia, and Antarctica. It was called Gondwana. Laurentia and Gondwana were adjacent parts of Rodinia. The rift between them opened and eventually became a full fledged ocean -- the Iapetus Sea. Shortly after the Iapetus started to open, a rift developed in Gondwona that calved a long narrow strip of continental rock called Avalonia into the Iapetus. As time passed, the ocean between Laurentia and Avalonia ceased to widen. One of more subduction zones appeared where surface rocks were sucked into the Earth, and the Iapetus started to close. Eventually, it closed completely folding many hundreds of kilometers of sea bottom into a confused jumble of rocks that can easily be driven across in a few hours. The cycle of an ocean opening and subsequently closing again is called a Wilson Cycle and is apparently fairly common. The rocks between the nearly four billion year old sediments of the Northwest territories and the relatively young rocks of the St Lawrence River Valley have been interpreted as being the result of a number of Wilson Cycles slowly building Laurentia by a series of fractures, seas opening, seas closing, and a new fracture developing a few hundred kilometers outboard of the previous fracture. During the opening phase, there was presumably a mid-ocean ridge laying down lava on both sides that became the floor of the Iapetus Sea. Once the opening phase ceased, subduction zones developed along which the Iapetus Sea bottom was sucked into the Earth's mantle. When the material being sucked into subduction zones melts it tends to rise, creating arcs of volcanoes similar to those seen today off the East coast of Asia. These "island arcs" are often fringed by forearc and backarc basins that quickly fill with material eroded from the island arc volcanoes as well as the continents fringing the contracting ocean. These arcs may fill completely and turn into low lying land. A variety of rock types can be found in these seafloor/basin/arc volcano complexes. What they have in common is that they are rarely very rich in fossils. To further exacerbate the situation as the seas close, the rocks are folded and overthrust in complex patterns. Thousands of kilometers of seafloor may eventually be lost to subduction and erosion. Further some of the rocks exposed in these belts may have been subducted, altered by heat and pressure, then brought back to the surface. Sorting out the provenance and nature of the rocks and the interrelationships of rocks of the same age is a huge job that has only just been started. Newfoundland geology was described by Sir Charles Murray head of the Newfoundland Geologic Survey in the 19th Century. He defined a number of zones of rocks deposited in strips running Northeast to Southwest parallel to the West coast of Newfoundland. Some of these zones have survived into modern usage sometimes a bit mangled. The Avalon zone on the East is described here as the Avalon Terrane. The Humber Zone on the West will be described along with the other Taconic-Laurentian Margin rocks. The original Dashwoods, Notre Dame, Dunnage, Gander, Exploits, Zones are usually combined into two zones. The Dunnage zone found East of the Humber zone consists of obvious deep sea bottom sediments -- volcanics and deep water sediments. It is split by the Red Indian Line which is thought to represent a major divide between surviving rocks from the Eastern and Western Iapetus seabottoms. The Gander zone further East consists of "clastics" -- sandstones and shales -- intruded by igneous rocks such as granite and of metamorphosed rocks of various sorts. It is separated from the Dunnage Zone by the Reach Fault. Since granite is a rock typical of continental volcanic activity rather than deep sea vulcanism it is thought that Avalonian continental rock underlies the Gander rocks at depth. Other nomenclature is used by various authors. Being clairvoyance deprived, I will not attempt to describe the nomenclature and geology further. The Dunnage-Gander rocks contain a few fossils. Enough to demonstrate that they are early Paleozoic and are of marine origin. Some Silurian fossils are found near Glenwood. In New England, the rocks not belonging to younger "cover terranes" such as the Triassic Basin rocks resemble the Dunnage Zone of Newfoundland to some extent. Rock types are more diverse as they include sediments apparently laid down in shallow waters adjacent to volcanic island arcs as well as some Devonian deposits laid down in shallow basins or in lowlands remaining after the basins filled with sediment. I have quite arbitrarily placed the "Dunnage-Humber" boundary at roughly the Easternmost occurrences of well preserved, shallow water, Laurentian fossils even though in some cases, these manage to be somewhat East of regions of what are clearly continental slope deposits and in other cases regions of fairly strongly metamorphosed rocks exist to the West of my boundary. A few outcrops of Ordovician and Silurian rocks are found in Maine. Devonian marine fossils and plants are found in basins in the central part of the state. 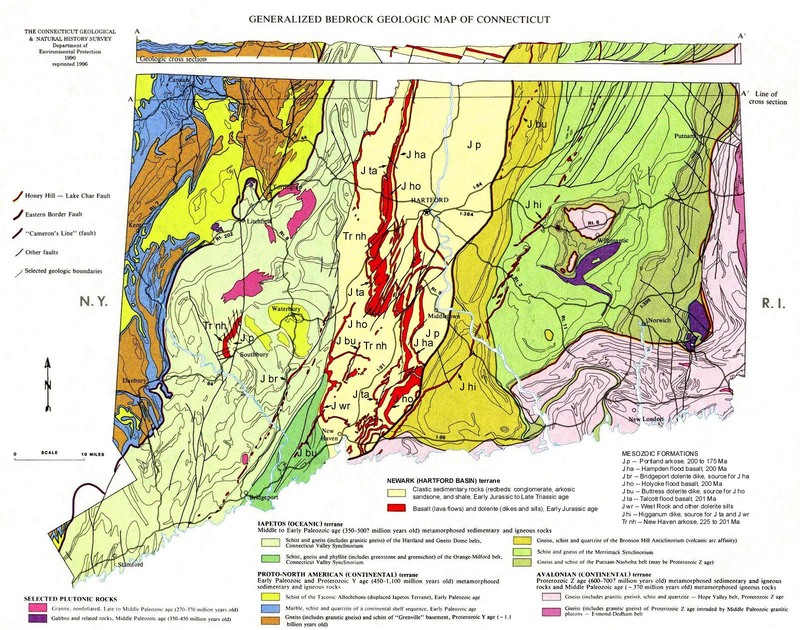 A few Silurian and Devonian fossils are found in a strip of mildly altered sandstones and limestones along the Connecticut River from Bernardston, MA to and beyond Littleton, NH. Graptolites are found at a number of localities in Northern and Central Vermont. 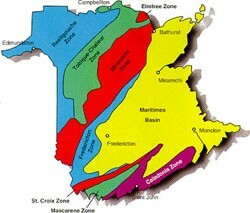 In New Brunswick the Northwestern third of the province is covered with Paleozoic rocks similar those of Maine. A relatively narrow strip on the Southeast side of this belt is mapped as Dunnage and Gander rocks with the beds further Northwest being Silurian and Devonian sediments. The Southeast portion of the province is covered with Maritime Cover Terrane and Avalonian. For the present, I am assuming that Ordovician and older rocks in New Brunswick are Dunnage-Gander or Avalonian and that Silurian or later rocks are Avalonian or questionably Dunnage. Many authors would disagree and possibly allocate Silurian/Devonian rocks in Northwest New Brunswick to the Humber zone of Laurentian Margin rocks. Some of the formations listed below may belong in the Taconic-Laurentian margins Terrane and vice versa -- especially in Southeast Pennsylvania and Georgia where the sources I have examined so far do not differentiate the two. No recommended localities. Fossils are uncommon in most of the Dunnage/Gander rocks and most seem not terribly interesting except to the extent that they allow some formations to be dated. Some of the Silurian and Devonian beds of Northwest New Brunswick may be an exception as fossils seem perhaps to be more abundant, more diverse, and better preserved there. [http://web.archive.org/web/20060910144225/http://earth.geology.yale.edu/~ajs/1994/04.1994.01Schwab.pdf] get map from here. http://wayback.archive.org/web/20060908205015/http://earth.geology.yale.edu/~ajs/1998/02.1998.01Hibbard.pdf get map from here.